Exploring International Cultures Through Theater and Art! WINTER 2015 Semester starts January 26th! EARLY REGISTRATION DISCOUNT BY JANUARY! ), 2015th!!!! Join Ambassador Theater in discovering the beauty of children's international literature and culture, explore nursery rhymes, songs, fables and walk through the adventures of many famous characters from the most admired stories. 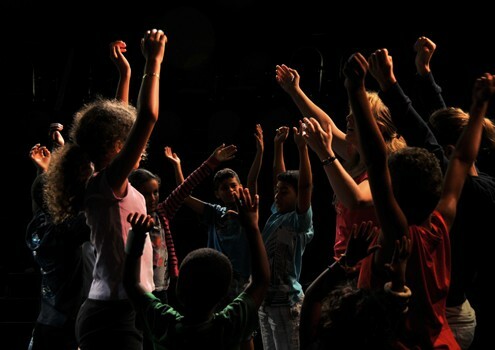 The classes are taught by a professional, acting coaches and artists, whose main focus will be movement, speech and basic acting skills with fun theater games and will finish with a final showcase at the Convergence, THE LAB Theater, 1819 N. Quaker Lane (at Crestwood Drive), Alexandria VA 22302 We also offer exciting Art Classes that help the kids connect with what they learn about in their drama classes. They are able to understand how theater is a true collaboration of all art forms and will focus on making some props, parts of the costumes they will use in their performance, learn about the genre and style used in the play and culture they are studying, and more. We also offer special private classes on Mondays, and Wednesdays! Learn to make strong, specific and memorable choices for your monologue and cold reading while you get introduced to powerful audition techniques. Lilia Slavova’s direct, personal, honest and practical approach comes from years of experience as an award winning actor ,director, choreographer, puppeteer and published author. Member of SAG, AFTRA ,Equity, Lilia has been attending the Actor’s Center and the League Auditions for the last 15 years in a casting capacity; this and her international theatrical experience makes her ideal coach for helping you achieve your auditioning and professional goals. Lilia’s work with preparing students for colleges is fantastic since the success of her student entering the collages of their choice is 100% plus the scholarships they receive! TESTEMONIES FROM HER STUDENTS ARE AVAILABLE TO READ! Contact us with any questions using our online form or email us at ambassadortheater@aticc.org.